We have always had Mega Bloks but they have recently been left quite neglected in the playroom. 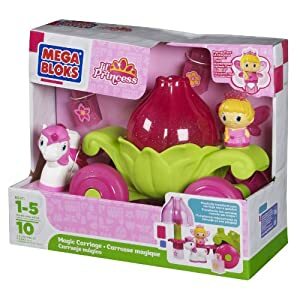 I wasn’t completely sure if my daughter would be that interested when we were asked to review the new Mega Bloks Lil’ Princess Range. Anyway these lil’ princesses are just launched in the UK and they are totally gorgeous and by Annalise’s account great fun to play with, let me introduce you. The little boxed set (£7.99)……. Mega Bloks Lil’ Princess Starlight is apparently the most cheerful princess in the Secret Forest! Last but not least we have our third princess and pony (they look like unicorns to me!) my personal favourite Princess Dewdrop and her adventurous pony Mist. I love how they have little personalities and names. Annalise of course simply changed these though. All of these princesses combine with other Mega Bloks Lil’ Princess buildable playsets. Annalise loved the fact that a beautiful tiara magically appeared on her princesses when they were placed on top of their favourite pony pals or on a block. She also loved the sparkly bloks that were included. She built them a stable and for three days in a row now Mega Bloks (including all her old Bloks) has been the first thing she has played with each morning. I love her to play construction and engage her imagination and I love it when old toys are re-found and enjopyed again. In the collection is a magical carriage play set that comes with Princess Blossom, her pony Rose, and sparkling pieces that encourage imaginative play. which retails for £14.99 on Amazon. 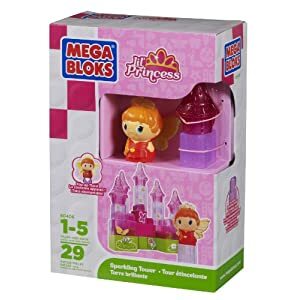 The Mega Bloks Lil’ Princess collection is perfect for little girls that like princesses. With the sparkling blocks, pretty characters, accessories, and play sets they will be in magical fairy princess heaven. 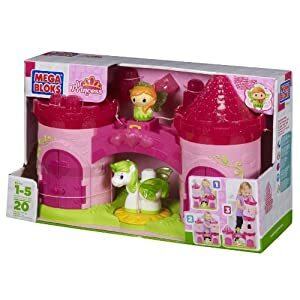 Mega Bloks Lil’ Princess range is available at all major toy shops and supermarkets. Previous Post A very good idea for thrifty green parents.